This apple nachos post is sponsored by Martin’s Apple Chips but, as always, my opinions are entirely my own. He just started kindergarten this fall, but it’s happening already. Welcome to your life, kid. Sorry. I’m a dietitian mama who makes things from scratch. The snacks I send you are going to be lower in sugar than the other kids’. They’re gonna be mostly homemade. It’s going to be a long school career for you. I totally feel for him. My mom always sent me to school with her homemade fruit roll-ups, granola bars, and fresh baked cookies. Looking back I can see that I really was the lucky one… but I didn’t see it at the time. As a kid, sometimes you just want what all the other kids have! So it’s nice to have an option that will make both the parents and the kids happy occasionally. Which is why I’m happy to have been sent these Apple Chips! They’re a fun treat that come in a little snack pack, and yet they’re still JUST 100% APPLES! Win-win all around! My son gets a “fun” snack and I get to send him with something that doesn’t have added sugars, artificial colours, flavours, etc. The apple chips themselves are nut-free and available in single serving bags, which make them a convenient bagged lunch option. But the awesome thing I found is that they’re a great base for these hot and cheesy apple nachos. Since most schools don’t allow nuts inside their doors, a snack at home is a great time to serve them! I’ve made apple nachos with slices of fresh apples, various toppings, and peanut butter or chocolate drizzle. 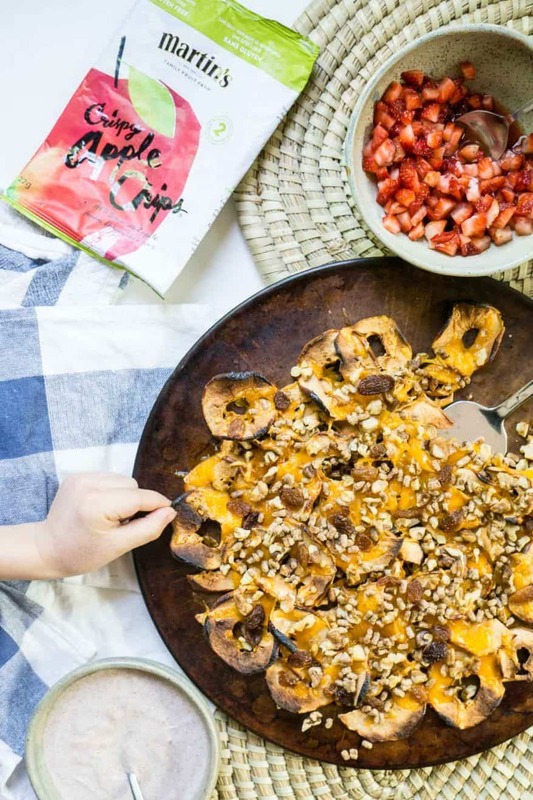 While it was certainly delicious (and a hit with my family), the apple nachos were basically fruit and dip…. they weren’t very nacho-esque. They weren’t hot, crunchy, glued together by melty cheese, nor dip-able in salsa! So when I was invited to partner with Martin’s Apple Chips, I set out to make some LEGIT nachos! Crunchy base: Martin’s Apple Chips are the perfect base! 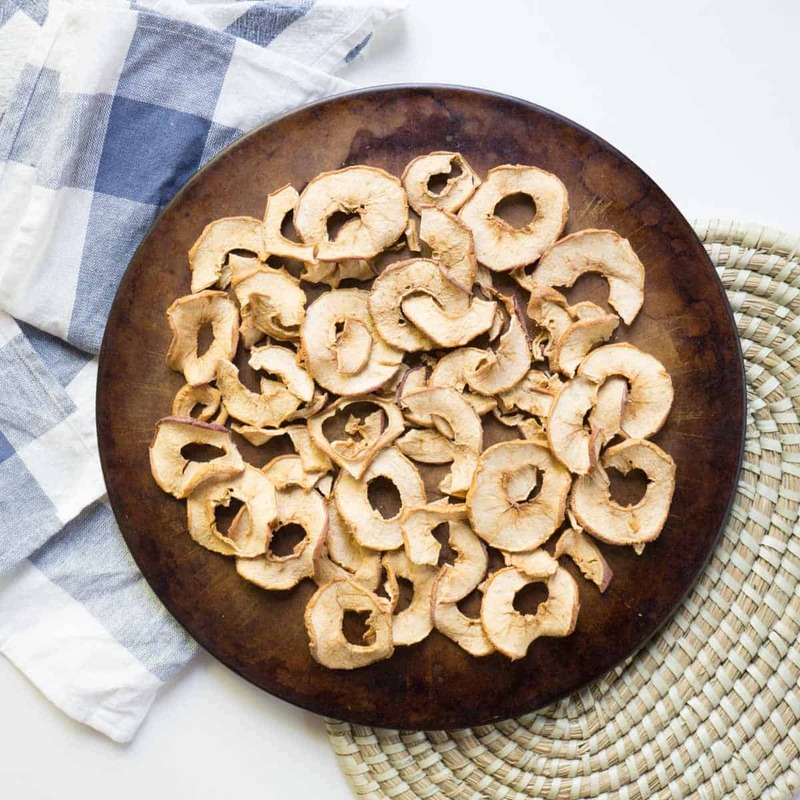 Unlike other dehydrated apples that are still soft and floppy, these are very crisp and can hold toppings without falling over. Melty cheese: apples and cheddar are made for each other, so that is a natural choice! Yummy toppings: walnuts and raisins are also natural pairings for apples, so those need to go on. 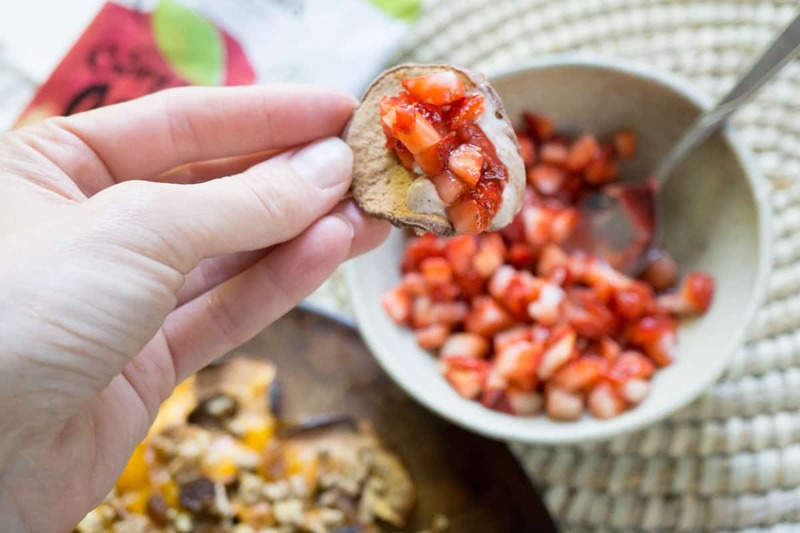 Salsa: chopped strawberries with a touch of balsamic vinegar add a nice, fresh flavour to the crunchy nachos. Sour cream:. for obvious reasons sour cream might be a bit weird, so my replacement is a lightly sweetened yogurt dip with warm, fall spices (reminiscent of apple pie). 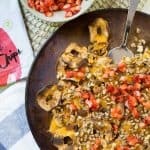 Our minds often turn to exotic things like goji berries and matcha powder, but everyday foods can be just as “super” nutritious for you! Take apples, for example. They’re so ubiquitous in North America… one hardly thinks about their nutrition. But the old adage may ring true: an apple a day keeps the doctor away! Apples are a terrific source of fibre and anti-oxidants, a lot of which is found in the skin. I’m very pleased that Martin’s Apple Chips keep the peel on! One study showed that apples are rich in free phenolics, which mean they aren’t bound to other compounds and are more readily available for the digestive system to absorb. Walnuts are a good source of healthy fats, including the essential omega 3 fat called alpha linolenic acid (ALA for short). They are called “essential” because our bodies can’t make them; we need to get them through food! Omega 3 fats are the preferred building material for cell membranes, and are protective of our brain and nervous system. Strawberries are a great source of Vitamin C, which is important for our immune function, and the health of our skin, hair, and nails. Studies also show that phytochemicals in strawberries protect our bones! Did you know that the ugly apples aren’t allowed in grocery stores? People won’t buy them. We’re a shallow bunch of people as grocery shoppers, aren’t we? But apples are healthy and delicious, even if they’re oddly shaped. So products like the dried apple chips are a great use for them. They actually help to reduce global food waste! 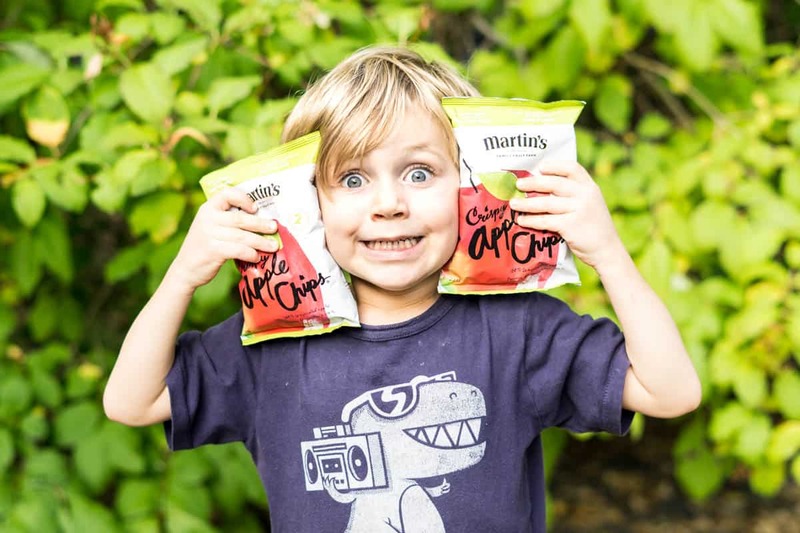 Where to buy Martin’s Apple Chips: These are available across Canada in many retailers including Bulk Barn, Farm Boy, Sobeys, Winners, Starbucks, and Costco. Lucky you! That makes it so easy to make these apple nachos. Apple Nachos -hot and cheesy! 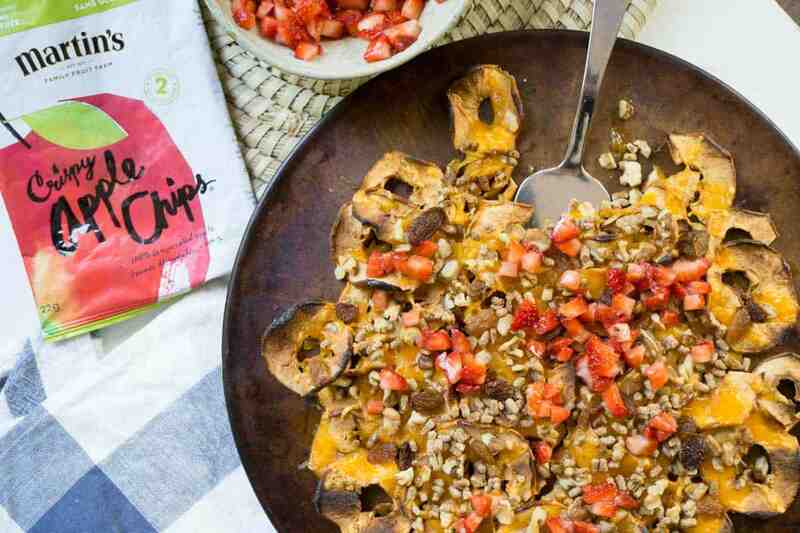 Healthy nachos made with a base of crispy apple chips, layered with walnuts, raisins, cheddar, strawberry salsa, and dipped in a spiced yogurt dip! Place an oven rack in the top slot in your oven. Turn oven on to broil. Place the apple chips in a single layer on a baking sheet. Top with shredded cheese, walnuts, high fibre cereal, and raisins. Bake for 1-2 minutes, or until the cheese is melty and bubbly. Watch carefully as the chips can burn easily. For the yogurt dip, stir all ingredients together. For the salsa, stir all ingredients together. To eat, dip the nachos in the yogurt dip and spoon some salsa on top!